This year I would like to wish all my family and friends, near and far, a very special Christmas/holiday season, one that is a little more reflective than my usual celebratory ‘Rejoice’. 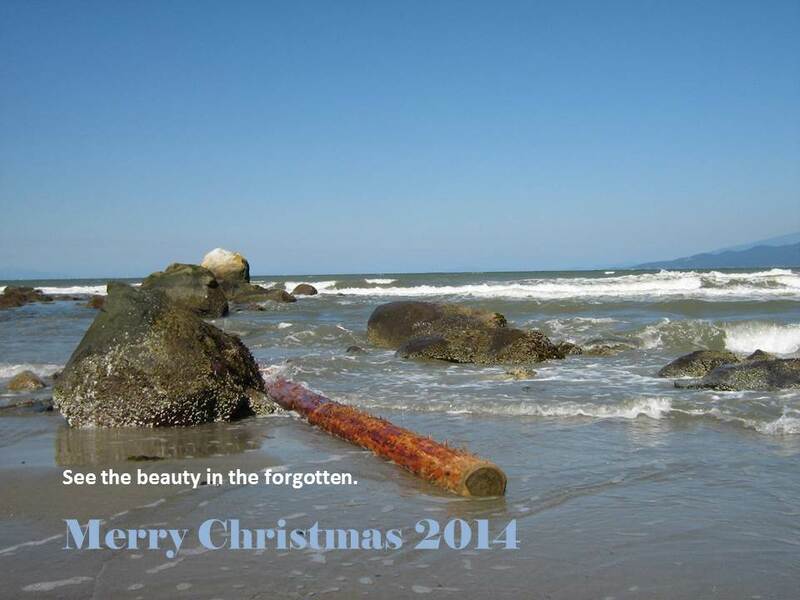 My message this year: See the beauty in the forgotten. Search out and celebrate the forgotten. Why is this message important to me? In July, standing on a gorgeous beach in Vancouver, with sunshine lighting the water, the sand, the forest, there was a forgotten log. It had gone adrift from the lumber floats brought down to Vancouver harbour, and come ashore on Wreck Beach. I thought it was beautiful, the angle of the log against the sand, rocks and waves – I took perhaps five or six photos of it, trying to be artistic. And yet, this log wasn’t one of the beautiful old trees standing in Stanley Park, or even one of the young trees we passed when climbing The Chief. And it wasn’t cut down to be a Christmas tree, to be adorned with tinsel and decorations or to have a Christmas Angel sit at its top. It was a log cut down, one of many, as part of British Columbia’s forestry industry. And even then, when I saw it, its value seemed worthless, as it hadn’t even made it to the lumber yard to become beautiful furniture, or lovely writing paper, or even perhaps an instrument with which to share music. It was just a log, forgotten. And what really struck me, is how much things – and people! – are forgotten in our own lives. Even in the story of Christmas, so many things are forgotten: Jesus may have been born in a manger, no crib for a bed, but afterwards, there were shepherds and wise men and a star above. What about those children born at the same time? What were the names of those children Herod killed? What value could they have brought if they had been allowed to live? I know that many things in my life have gone celebrated, or unappreciated, and I have tried this year, in my own small ways, to reach out to others and show them how much I value them in my life. I’ve discovered some wonderful things, and – quite joyfully and humbly – been amazed at the wonderful response I have received. Because I think, when a forgotten thing is remembered, then our lives are richer for it. That thing forgotten once again has the potential to contribute and influence, and give yet another perspective, or experience, otherwise missing from our lives. And I am glad for it. And so I hope, for your Christmas – or other important holiday celebration! – you also have the chance to appreciate this beauty. That to remember something forgotten has an incredible value, one that enriches each person’s life beyond the act of remembrance. And what of the forgotten log? I was told that it would be eventually recovered, as would all logs randomly floating in Vancouver harbour. There is a dedicated recovery boat that collects the logs and returns them to the lumber yard. Because, after all, these logs too are valuable.